A few years ago I was introduced to the best top water bass fly I've ever fished. When I first tried the fly I didn't understand what made it so great. It just seemed like some foam and bucktail. Then as I worked the fly I noticed it dipped under the surface with each strip and slowly rose back to the surface. The rising fly was accompanied by several air bubbles. 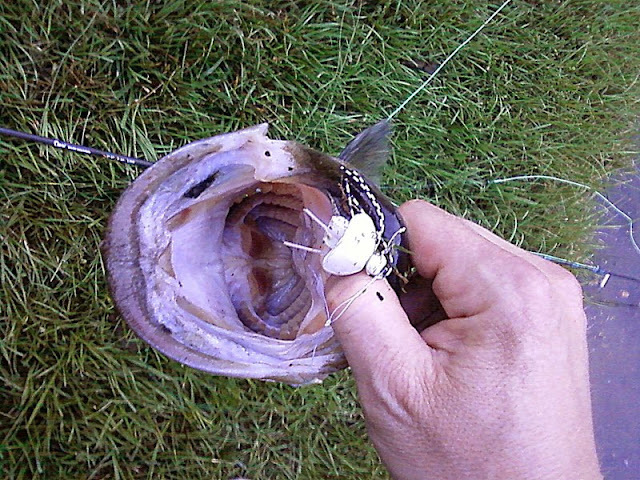 Several bass mouthed the fly and I was amazed by how long they would hold onto it. I can only imagine because of the gushy life like feel. The fly works well stripped fast, slow or sitting with no action at all on the water. The fly has a ton of versatility. If the dips and air bubbles don't entice a strike the rubber legs might be just enough to get the fish to commit. I've found when I fish for bass I use this fly every time with out exception. The fly is fairly easy to tie. It can be tied in a few minutes once you get the hang of it. Kent Edmonds is the unofficial inventor of the fly and he has detailed instructions on his site. 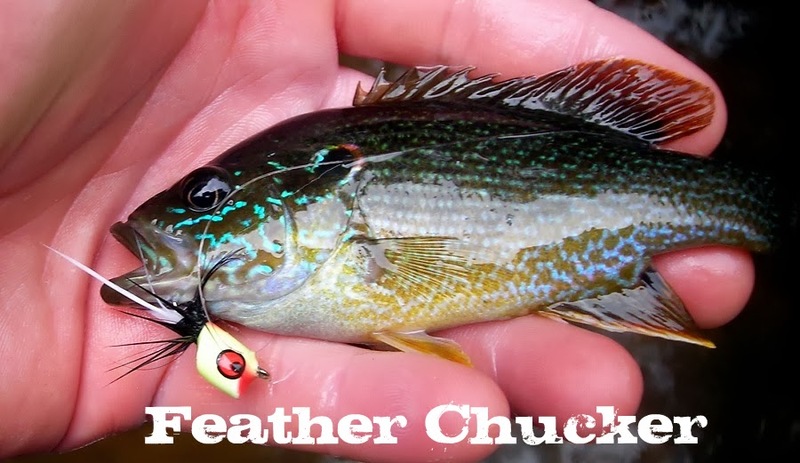 Once you see a bass crush one of these flies you'll always have one in your fly box. The great thing is there is no real wrong way to tie them. I usually experiment with several colors. The fly on the bottom left is a frog I tried to make. I saw the pattern on another site and I loved the look of it. The fly didn't turn out exactly as I'd hoped but I still think it will work. Videos like this make me sick with envy. It's that time of year again. A warm front has moved in giving us the first feeling of spring. I took advantage and headed to the mtns. It's the same every year. I fight with trees the first 20min. There's time spent figuring out my cast again and learning how to properly nymph. It's only been a few months since I fished for trout but my casting and drifts were horrible. My hooksets were abysmal. The first few fish literally swam away with my fly before I even noticed they were on. There were several foul hook sets which usually is a result of poor timing. It took me a while to finally hook a fish in its mouth. It might take a few months to forget the tug of a trout but only 2 seconds to remember the joy of catching one. Just like the weather was figuring itself out I was doing the same. Eventually my cast, timing and drift came together. I started to realize what the fish wanted and got into a rhythm. The sun was intense and the bugs were taking advantage. I've never seen this many mayflies on this stretch of river. The ground has been snow covered for over a week and the scenery still has the look of winter. My buddy had me try his secret fly and it was doing well. Eventually I had to try my soft hackles. The current made me play around with different depths. Once the flies were on the bottom the fish started to come. It was a great day and I'm glad to know my soft hackles are still working. It seemed the color of the bead made a difference. The fish preferred the gold bead as apposed to copper. Over the last few years I have been getting more interested in owls. I've seen several Barred Owls around but I have yet to see a Great Horned Owl. While fishing about an hour before dusk I've heard owls hoot several times. I wonder how many times I ignored them in the past. Some of the sounds owls make are like nothing you'd imagine. Especially the sound of owls caterwauling. I've heard this once and it actually freaked me out a little. It sounded more like a monkey than a bird. It's fun to hear the owls but I want to see one up close. A lot of people use owl calls to draw them in. I started to research owl calls and found out some interesting things. I never knew this but owls and crows hate each other. If you call one you can attract the other. An owl call is also commonly used when turkey hunting. I looked for a reason why turkeys respond but never found any scientific evidence to support theories. The next step was looking for the right call. There's so many calls out there for specific purposes it can get daunting. I finally ran across Primos Hoot Flute. The reviews of this product made me pull the trigger. Many of the buyers were using this call to attract owls and not for hunting. I have always been impressed with people who can use animal calls. It seems like a skill that's a integral part of a hunters arsenal. I wasn't sure if I had the patience to work with this and get the call right. When the flute came I was surprised at how large it was. I couldn't wait to try it out. I opened the package and went outside immediately. Primos made this flute fool proof. It took about a minute or so before I made sounds that were what I think at least are similar to an owl. There are holes on the side of the flute that give different pitches to the call. The other calls I looked into have a kazoo or duck call tone to them. 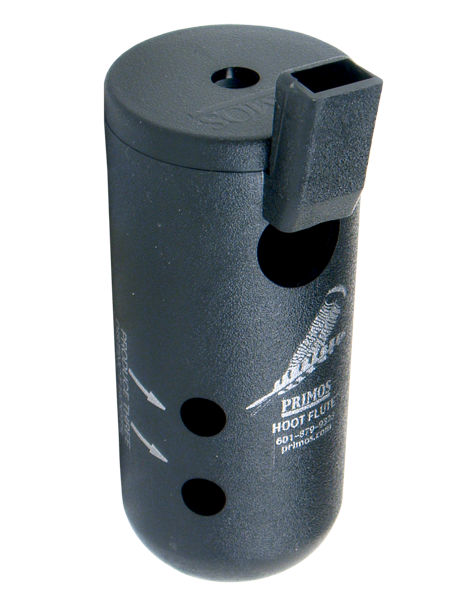 The Hoot Flute has a more deep owl sound. I expected crows to start flying overhead any time. I did see crows but they didn't seem to care about the call that much. They kept flying by. Other birds were landing on trees nearby. Were they attracted by the call? I don't think so. My expectations were kind of silly. I seriously half expected to go outside blow this thing and hear an owl. Even in the middle of the day. My neighbors came out and game me funny looks but I found the more serious you look even when doing something strange people will dismiss it. My favorite part was having my son try it. It was magic to see his face light up when he made a little hoot noise. "That's an owl thing!" he said. This call will be fun to play around with when we're hiking in the woods.